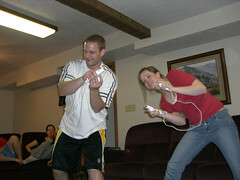 Who got Wii’s for Christmas? HOW MUCH FUN ARE THEY? We did a little golfing, a little baseball, a little tennis, some bowling and a whole lot of boxing. 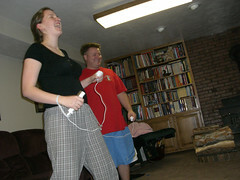 Because Wii boxing unleashes any pent up anger you may be feeling and allows you to kick the virtual trash out of your spouse who insists that when he said he “suffers your wrath” he meant it as a compliment. And kick his trash I did. I’m even a little sore. I’ll tell you what, you hold your abs in tight enough and virtual whoopings become a full body workout. Yep, this old lady was winded by a VIDEO GAME. I only suffered one injury during tennis, Cody got me with his virtual backhand. This is where I mention that all those claims that people made about throwing themselves or their Wii remotes through the TV are COMPLETELY TRUE. Because it nearly happened to us. And then there was the baby that played along. Turns out I’m not the only one addicted to baby crack. Watching Cody hold and play with a little two month old baby girl? A dozen half naked Australian male models rubbing me down with exotic oils don’t even hold a CANDLE to Cody playing with a two month old baby girl. Next year I would like a Wii and a baby girl. here’s hoping you get your wish in 2008: a wee thing and a wii thing. We got a Wii (but not a Wee, thank goodness), and I.AM.SO.SORE. from playing that thing! OYE! We haven’t shut it off for two days! Here’s to you new years wish of a Wii and a Wee! How sweet does Cody look in that picture???? I hope you get your wishlist next year! Get me one too, only leave out the Wii part. Just see if you can arrange the baby girls, one for me & one for you. Maybe you have more clout with the Big guy (doesn’t matter which one!). I can’t even reflect on the hell that was acquiring our Wii last year. Shudder. The baby burrito is killin’ me. husband got a wii for christmas…have not seen him since. I got a baby girl about 6 months ago (early gift I guess)…..so much better than the wii. Hope you get a babylady next year….you deserve it. We got a Wii but the boys have totally hogged it and I haven’t been able to play yet. I definitely need the ab work out because my fudge this year….turned out SOOO good. We got a Wii for Christmas, but thankfully not a wee one. I barely have enough energy for the Wii! OOOO, me too! I have been looking for both for a year now and they are elusive. I’m saying a prayer that you get what you want next year. And husband + babies always = a beautiful sight. I am always sore after the boxing, but completely hooked on Big Brain Academy…you REALLY need a Wii! 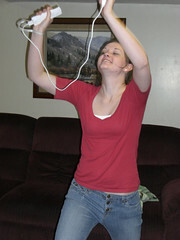 Oooh, I love the wii! Except for the dumb games that are like all other video games where you just sit there. I’m totally diggin’ our new Wii! The tennis game is my favorite. Wii’s rock!! WE love them! The pictures are darling and yes, Cody holding that darling little baby girl is precious. My mother wanted a Wii for Christmas…who can say no to that? Interesting seeing her bowl against a 5 year old. 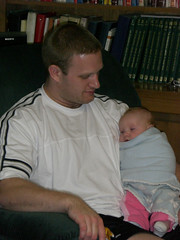 Great pic of the hubby and the baby!! May both your wishes come true for 2008. I was just talking to my mom, who said that they went to a Christmas party and they had a Wii set up for the guests to play. Now, my mom is thinking of getting one! That cracks me up. She can hardly work a satellite remote, but she wants a Wii. a wii and a baby girl would be the perfect gift. i love my wii…and spent all christmas toting aroung my baby niece…because. she’s. too. cute. my brother-in-law got a Wii…jerk! okay, he’s not a jerk…i’m a little jealous! on the bright side, i will be moving to within 6 minutes of their house in February. much better than the current 40 minute drive! I’ll take one of each too.